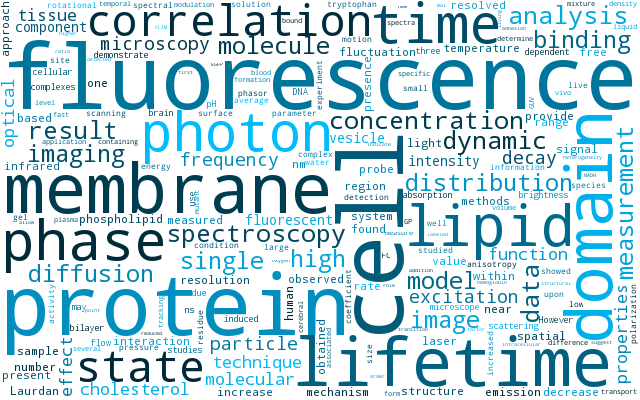 The Laboratory for Fluorescence Dynamics' (LFD) database of publications contains more than 2200 journal articles, book chapters, conference proceedings, abstracts, patents, and theses by members of the LFD, and also selected publications of interest to the fluorescence community. Electronic documents are not available publicly due to copyright restrictions. 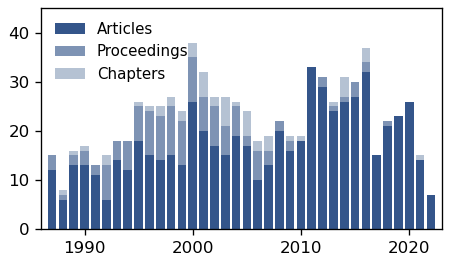 Reprints can be requested from the authors. Planes N, Digman MA, Vanderheyden PPML, Gratton E, Caballero-George C.
Biochim Biophys Acta Gen Subj. 2019; 1863(5): 917-924. Visualizing the regulation of SLC34 proteins at the apical membrane. The cloning of the renal NaPi-2a (SLC34A1) and NaPi-2c (SLC34A3) phosphate transporters has made it possible to characterize the molecular and biophysical regulation of renal proximal tubular reabsorption of inorganic phosphate (Pi). Dietary factors, such as Pi and K, and several hormones and phosphatonins, including parathyroid hormone (PTH), fibroblast growth factor 23 (FGF23), and glucocorticoids, regulate the transporters through various transcriptional, translational, and post-translational mechanisms that involve acute trafficking via endocytosis or exocytosis, interactions with PDZ domain proteins, lipid microdomains, and diffusion and clustering in the apical brush border membrane. The visualization of these trafficking events by means of novel microscopy techniques that includes fluorescence lifetime imaging microscopy (FLIM), Förster resonance energy transfer (FRET), fluctuation correlation spectroscopy (FCS), and modulation tracking (MT), is the primary focus of this review. Lou J, Scipioni L, Wright BK, Bartolec TK, Zhang J, Masamsetti VP, Gaus K, Gratton E, Cesare AJ, Hinde E.
To investigate how chromatin architecture is spatiotemporally organized at a double-strand break (DSB) repair locus, we established a biophysical method to quantify chromatin compaction at the nucleosome level during the DNA damage response (DDR). The method is based on phasor image-correlation spectroscopy of histone fluorescence lifetime imaging microscopy (FLIM)-Förster resonance energy transfer (FRET) microscopy data acquired in live cells coexpressing H2B-eGFP and H2B-mCherry. This multiplexed approach generates spatiotemporal maps of nuclear-wide chromatin compaction that, when coupled with laser microirradiation-induced DSBs, quantify the size, stability, and spacing between compact chromatin foci throughout the DDR. Using this technology, we identify that ataxia-telangiectasia mutated (ATM) and RNF8 regulate rapid chromatin decompaction at DSBs and formation of compact chromatin foci surrounding the repair locus. This chromatin architecture serves to demarcate the repair locus from the surrounding nuclear environment and modulate 53BP1 mobility. Cell Metab. 2019; [Epub ahead of print]. 3D orbital tracking under STED microscopy. 63rd Annual Meeting of the Biophysical Society. Baltimore, Maryland. March 2–6, 2019. Biophys J. 2019; 116(3, Suppl 1): 440a, 2174-Pos. Gratton E, Rossetta A, Chen H.
A new faster Flimbox with higher harmonic content and multi detector input. Biophys J. 2019; 116(3, Suppl 1): 441a, 2179-Pos. Tedeschi G, Scipioni L, Trinh A, Lee KA, Malacrida LS, Digman MA, Gratton E.
Characterization of the metabolic state and molecular crowding in breast cancer spheroids. Biophys J. 2019; 116(3, Suppl 1): 421a, 2080-Pos. Spheroids are 3D cultures of cells specifically grown in order to create a single spherical cell mass, which can be used as a model for studying the behavior of tumors in a controlled environment. Despite being a simplistic model, it allows for the rapid creation of the samples and displays a more complex physiology when compared to 2D cultures . The spheroids grown for this study are derived from two different breast adenocarcinoma cell lines, MCF7 and MDA-MB231, which display less and more invasive behavior, respectively. From 20,000 cells, our protocol provides spheres with a diameter of approximately 400 μm. The spheres were then transferred to a collagen Type-1 gel matrix in order to mimic the extracellular matrix. Adaptive optics in strongly scattering samples. Biophys J. 2019; 116(3, Suppl 1): 441a, 2181-Pos. Malacrida LS, Scipioni L, Gratton E.
In vivo chromatin compaction changes as detected by water dipolar relaxations: the molecular crowding role revealed by the ACDAN fluorescence. Biophys J. 2019; 116(3, Suppl 1): 70a, 355-Pos. Hedde PN, Staaf E, Singh SB, Johansson S, Gratton E.
Dynamics of activating and inhibitory receptors in Murine Natural Killer cells revealed by 2D pair correlation function analysis. Biophys J. 2019; 116(3, Suppl 1): 280a, 1380-Pos. Hyperspectral imaging in scattering media using two filters. Biophys J. 2019; 116(3, Suppl 1): 441a, 2178-Pos. Begarani F, D'Autilia F, Signore G, Gratton E, Beltram F, Cardarelli F.
Capturing metabolism-dependent solvent polarity fluctuations in a trafficking Lysosome. Biophys J. 2019; 116(3, Suppl 1): 307a, 1516-Plat. Scipioni L, Lanzanò L, Diaspro A, Gratton E.
Airyscan CCA provides structural and dynamics fingerprinting of subcellular compartments in living cells. Biophys J. 2019; 116(3, Suppl 1): 282a, 1389-Pos. Ranjit S, Malacrida LS, Gratton E.
The fluorescence lifetime of bound NADH: clues from the phasor plots. Biophys J. 2019; 116(3, Suppl 1): 565a, 2804-Pos. Chen H, Ma N, Kagawa K, Kawahito S, Digman MA, Gratton E.
Widefield multi-frequency fluorescence lifetime imaging using a two-tap CMOS camera with lateral electric field charge modulators. Biophys J. 2019; 116(3, Suppl 1): 567a, 2812-Pos. Cinco R, Hedde PN, Malacrida L, Digman MA, Gratton E.
Multi-modal fluorescence characterization of cell cycle progression and cytokinesis. Biophys J. 2019; 116(3, Suppl 1): 24a, 125-Plat. Digman MA, Lefebvre AEYT, Adame FA, Fong E.
The phasor FLIM analysis monitors metabolic changes at the leading edge in response to Rac photo-activation and mitochondrial transport in MDA MB231 cells. Biophys J. 2019; 116(3, Suppl 1): 442a, 2185-Pos. Lefebvre AEYT, Adame FA, Digman MA. A non-invasive metabolic investigation of breast cancer invasion. Biophys J. 2019; 116(3, Suppl 1): 550a, 2727-Pos. Ou CY, Vu T, Grunwald JT, Toledano M, Zimak J, Toosky M, Shen B, Zell JA, Gratton E, Abram TJ, Zhao W.
An ultrasensitive test for profiling circulating tumor DNA using integrated comprehensive droplet digital detection. Lab Chip. 2019; 19(6): 993-1005. Stringari C, Gratton E, Digman MA, Donovan P.
Phasor method to fluorescence lifetime microscopy to discriminate metabolic state of cells in living tissue. Patent US10222335B2, 05 Mar 2019. A label-free imaging method to monitor stem cell metabolism discriminates different states of stem cell as they differentiate in a living tissues. We use intrinsic fluorescence biomarkers and the phasor approach to Fluorescence Lifetime Imaging Microscopy (FLIM). We identify and map intrinsic fluorophores such as collagen, retinol, retinoic acid, flavins, nicotinamide adenine dinucleotide (NADH) and porphyrin. We measure the phasor values of germ cells in C. Elegans germ line. Their metabolic fingerprint cluster according to their differentiation state, reflecting changes in FAD concentration and NADH binding during the differentiation pathway. The phasor approach to lifetime imaging provides a label-free, fit-free and sensitive method to identify different metabolic state of cells during differentiation, to sense small changes in the redox state of cells and may identify symmetric and asymmetric divisions and predict cell fate. Begarani F, D'Autilia F, Signore G, Grosso AD, Cecchini M, Gratton E, Beltram F, Cardarelli F.
Capturing metabolism-dependent solvent dynamics in the lumen of a trafficking lysosome. ACS Nano. 2019; 13(2): 1670-1682. Hedde PN, Abram T, Vu T, Zhao W, Gratton E.
Dong Y, Digman MA, Brewer GJ. Age- and AD-related redox state of NADH in subcellular compartments by fluorescence lifetime imaging microscopy. Ma N, Kamalakshakurup G, Aghaamoo M, Lee AP, Digman MA. Label-Free Metabolic Classification of Single Cells in Droplets Using the Phasor Approach to Fluorescence Lifetime Imaging Microscopy. Cytometry A. 2019; 95(1): 93-100. Mah EJ, Lefebvre AEYT, McGahey GE, Yee AF, Digman MA. Collagen density modulates triple-negative breast cancer cell metabolism through adhesion-mediated contractility. Comprehensive correlation analysis for super-resolution dynamic fingerprinting of cellular compartments using the Zeiss Airyscan detector. The availability of the Airyscan detector in the Zeiss LSM 880 has made possible the development of a new concept in fluctuation correlation spectroscopy using super-resolution. The Airyscan unit acquires data simultaneously on 32 detectors arranged in a hexagonal array. This detector opens up the possibility to use fluctuation methods based on time correlation at single points or at a number of points simultaneously, as well as methods based on spatial correlation in the area covered by the detector. Given the frame rate of this detector, millions of frames can be acquired in seconds, providing a robust statistical basis for fluctuation data. We apply the comprehensive analysis to the molecular fluctuations of free GFP diffusing in live cells at different subcellular compartments to show that at the nanoscale different cell environments can be distinguished by the comprehensive fluctuation analysis. LAURDAN fluorescence and phasor plots reveal the effects of a H2O2 bolus in NIH-3T3 fibroblast membranes dynamics and hydration. Chen H, Ma N, Kagawa K, Kawahito S, Digman M, Gratton E.
J Biophotonics. 2018; [Epub ahead of print], e201800223. Fluorescence and phosphorescence lifetime imaging microscopy for spatial mapping of tumor behavior. PhD in Biomedical Engineering, University of California, Irvine, 2018. Fluorescence intensity measurements in cellular microscopy have become a valuable tool for resolving cellular structures and quantifying protein dynamics. Furthermore, the fluorescence lifetime can reveal additional information about the local molecular environment because the lifetime of a fluorophore is sensitive to changes in excited state reactions such as dynamic quenching. The spatial resolution afforded by these photoluminescence-based methods also enables the interrogation of non-homogeneous phenomenon in complex biological systems. Here, we applied lifetime imaging methods to spatially map variations in tumor behavior. Ranjit S, Malacrida L, Gratton E.
Differences between FLIM phasor analyses for data collected with the Becker and Hickl SPC830 card and with the FLIMbox card. Tenner A, Chu SH, Wetsel R, Cinco R, Gratton E, Fonseca M.
Complement proteins associated with synapse proteins in an Alzheimer's disease mouse model lacking C5aR1. 27th International Complement Workshop (ICW). Santa Fe, New Mexico. September 16–20, 2018. Mol Immunol. 2018; 102: 218. Ranjit S, Malacrida L, Jameson DM, Gratton E.
Nat. Protoc. 2018; 13(9): 1979-2004.